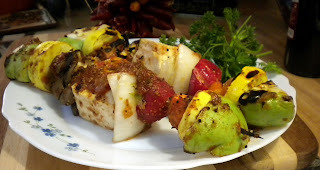 These very vegetarian kabobs were great even for a meat lover such as myself. One thing I really loved about them is just how colorful they were! Grill'em up and try them out today! Mix all ingredients together in a small bowl until even. String Wooden skewers with kabob ingredients and place in a deep sealable dish. Drizzle marinade over Kabobs evenly, seal and let marinate for 1-3 hours in a cool place. Lay kabobs on bottom grate and cook for 5-6 minutes. Flip the kabobs and poor the marinade from the sealable container over them, cook for another 5-6 minutes. Remove from grill and let cool for 1-2 minutes before serving hot, enjoy!